“Stormborn,” the 2nd episode in the penultimate season of Game of Thrones, was act 1 of a large game of risk played out on a large map of Westeros. While last week’s premiere episode gave characters time to breathe and delivered solid character moments, episode 2 was about turning the focus to the battle. Tyrion laid out the Dragon Queen’s initial plans before all the leaders who have joined her side. Jon Snow made his first major move of the season as he and Davos began their journey to Dragonstone to secure all that Dragonglass. And Cersei tried to build her forces by appealing to the fears of the remaining Lords of Westeros. But I don’t think anyone expects these initial steps in the game to go as planned. It only took one episode for Arya’s journey to kill Cersei to take a detour. And the first step in conquering Westeros for Daenarys has already been stopped cold by the execution by the first step of Euron’s game. The bottom line is we’ve got war. And it’s not like the war of previous seasons where everything led up to one ultimate episode 9 battle. Armed conflict of small and large scale will consume the remaining five episodes. Of course, it’s not like I’m giving you some deep insight here. We all knew (and the trailers confirmed) that battle was going to light the map of Westeros up. But knowing it’s going to happen and seeing the events we’ve been building to the last 6 seasons are two different things. And knowing that the true battle for Westeros is here should be a very exciting moment for all of us. 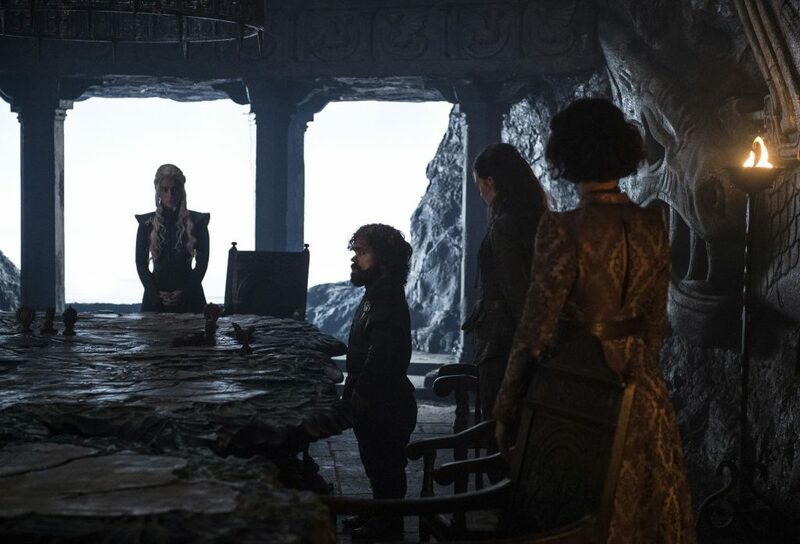 We’ll start our recap this week with a look in on Daenarys’s war council on Dragonstone. 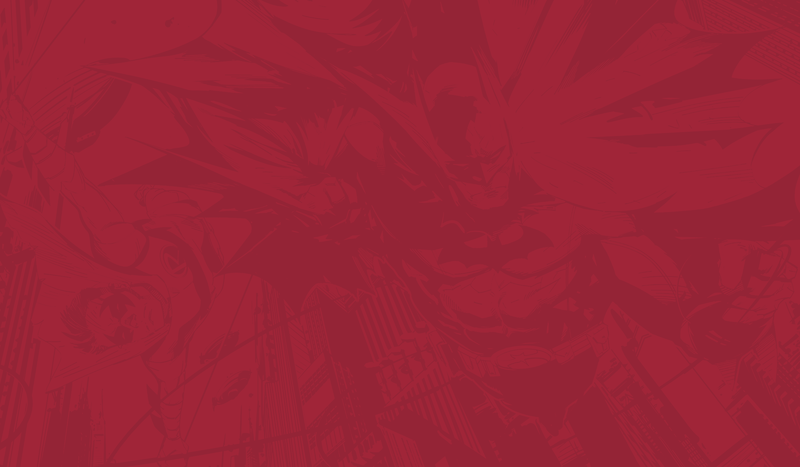 The show decided to address a large loose end in the show’s opening scene. Back in season 1, Varys delivered an order for then King Robert to kill Danearys. Fast forward to present day, where Dany questioned Lord Varys, asking why she should trust him and his ever-changing allegiances. Varys doesn’t shy away from his duplicity, admitting to his actions and claiming he works for the common people. The mother of dragons seems to accept Varys as a part of her council, encouraging him to be frank with her in the future, but threatening to burn him should he betray her. Later on, all of Dany’s allies meet to discuss her strategy for conquering Westeros. Tyrion runs the meeting, addressing the need for King’s Landing to be taken by a domestic army instead of an army of foreigners. Tyroin goes over the war map Daenarys and her allies. Tyrion wants the Iron Islanders to pick up the Dornish forces in Dorne and meet the Tyrells at the gates of King’s Landing. He will also be sending the Unsullied to take Casterly Rock, the seat of House Lannister. The best part of this council was the Queen of Thrones and her conversation with Daenarys. With Margaery dead, Olenna appears ready to take the Mother of Dragons under her wing. And her advice: “ignore your advisors” and “be the dragon.” Let’s all petition HBO to make sure Olenna Tyrell is around until the last episode airs. Meanwhile, in Winterfell, Jon receives a note from Tyrion encouraging him to come meet the Mother of Dragons. It was a smart move having Tyrion be the one who wrote this letter considering the previous relationship he has with Jon. But Jon, Sansa, and Davos all agree this meeting is too risky to attend. But my, how convenient (a major theme of the evening) it was that the next note Jon receives is the “There’s dragonglass on Dragonstone!! !” note Sam was preparing last week. 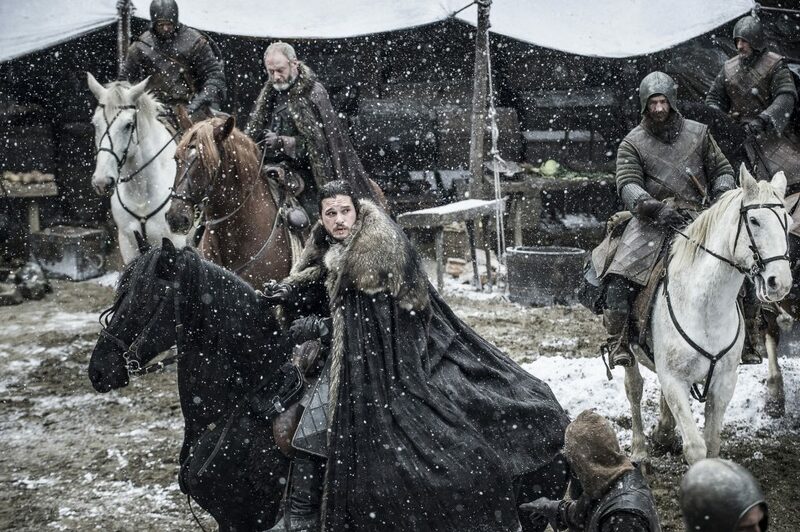 So despite the objections of those loyal to Jon, he’s heading to Dragonstone to meet with Queen Daenarys and get her help in the battle against the Night’s King. 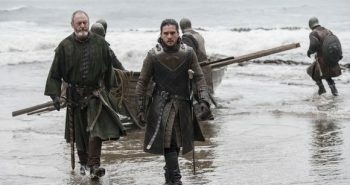 Jon and Davos prepare to make their journey to Dragonstone. While he’s gone, Sansa will rule in his stead, a statement that makes Littlefinger very happy. 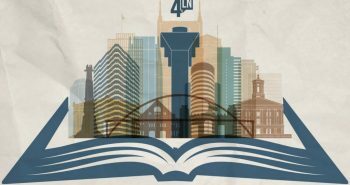 Now, Littlefinger makes very few mistakes as he calculates every step he takes in hopes of claiming the Iron Throne one day. But telling Jon “I love your sister” was a rather large one. 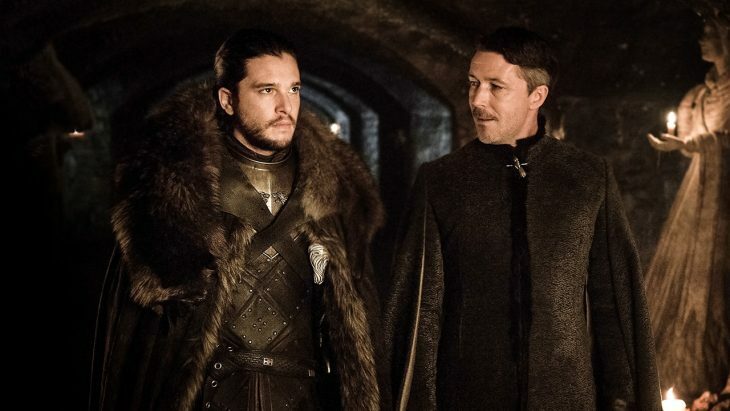 Jon informs Littlefinger that he will kill him if he touches Sansa as he strangles Sansa’s creepy uncle. 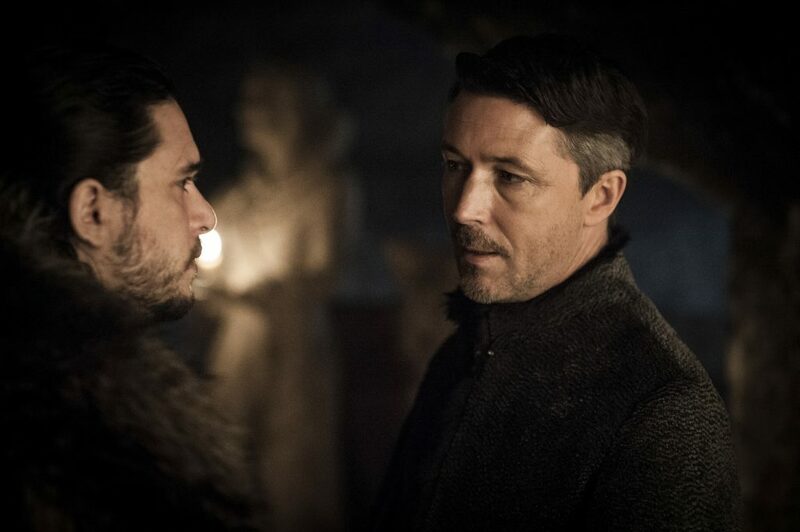 Baelish has a very unsuccessful meeting with Jon Snow. The only place war is not central to the discussion is Oldtown, where it seems every maester but Sam is unaware anybody’s getting ready to fight. And Archmaester Garwyn would have nothing to do with any solutions and revelations Sam makes. Archmaester Garwyn is giving Jorah a grim medical report, telling him has 6 months before he becomes a Stone Man. But Sam’s been reading, and he thinks he’s found a cure for greyscale, a notion the Archmaester quickly dismisses. 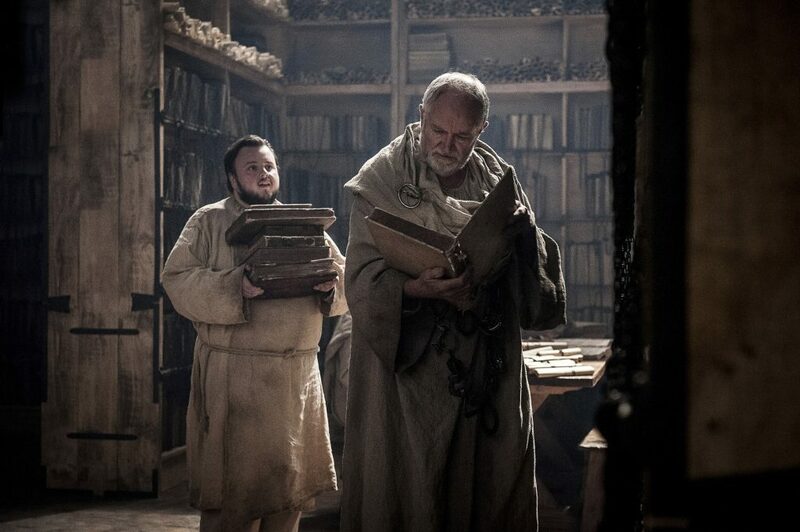 Sam holds books for the Archmaester while the Archmaester kills all of Sam’s ideas. But Sam has grown more defiant with each passing season. He moves forward with his plan in spite of the warnings and misgivings of Garwyn. He gives Jorah a bottle of “Stuttering Sam’s Greyscale Gone” and (in what might be the show’s grossest scene ever) begins carving the scabs off Jorah’s skin. We switch from Oldtown to the Riverlands (and from pus to soup one of the worst scene transitions any show has ever done), where Arya has stopped at the Inn at the Crossroads to eat and visit with her old friend Hot Pie. Arya tells her trusted friend where she’s going, but Hot Pie is shocked she’s not going back to Winterfell. The news of her family retaking her childhood home had not made it to Arya’s ears yet. So she decides, when faced with the choice of which way to go, to head back to Winterfell instead of continuing her journey to King’s Landing. Arya standing at a crossroads as she considers whether to go King’s Landing or Winterfell. 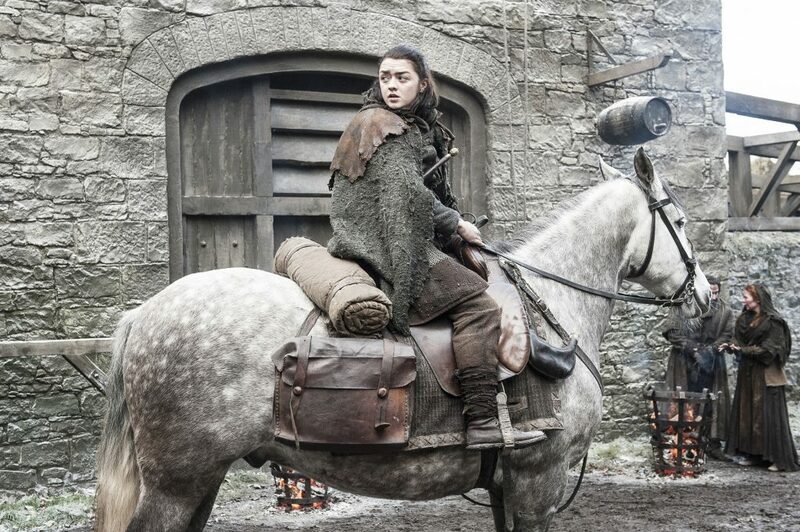 But a significant moment happens for Arya on her way back home. A pack of wolves surrounds her. And the leader of that pack is none other than Nymeria, the large direwolf she sent away back in season 1. At first, I thought that pack was going to end Arya’s journey right there. I mean, she was pretty mean when she sent Nymeria off. But the direwolf still had enough affection for Arya to let her live. She didn’t, however care to go back with Arya to Winterfell. When Nymeria leaves, Arya realizes Winterfell is not for Nymeria. And that is the questions we leave Arya contemplating for herself. Cersei is meeting with several Lords from the Reach asking for their support. Included among them is Randall Tarly (Sam’s father). Cersei uses fear to try and bring the lords to her side, using both the presence of the Dothraki and fear of the Targaryen name (another common theme this week) to try and rally their support. Lord Tarly brings up the matter of dealing with three dragons. Qyburn has a solution down in the dragonpit: a large crossbow meant to fire spears at high speeds at dragons. Jamie also meets with Lord Tarly, and we see the practical, loyal side of him we didn’t see last season. Jamie wants Sam’s father to lead the Queen’s army. But Lord Tarly doesn’t want to fight against the Tyrell’s, the Tarly’s bannerman. Jamie leaves Lord Tarly with these chilling words: “Do you fight with us or foreign savages and eunuchs? We’ll have to wait to hear Tarly’s response. Raise your hand if you though the first step in conquering Westeros was going to go smoothly? Anyone? On their way to Dorne, Ellaria and Yara’s girl fun play is interrupted by Euron. He promised Cersei a gift last week, and he’s here to claim it (or should I say them). “Crow’s Eye” we saw last season. 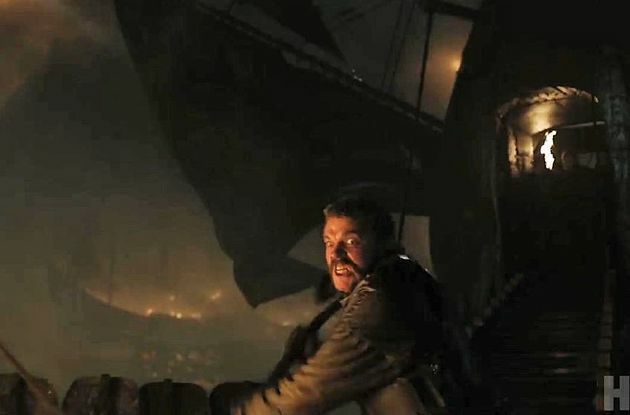 Euron invading Theon and Yara’s boat. Euron kills two Sand Snakes (yay!!!!) and has the third Sand Snake and Ellaria captured. Then, Euron holds an axe blade to Yara’s throat trying to goad Theon into a fight. But cowardly Theon rears his ugly head as he drops the sword and jumps into the water. A sluggish start to Dany’s plan to conquest Westeros for sure: the head’s of two major allies captured and a new, vile enemy strikes his first blow. -Dany will have a tall order convincing nobles that she is not her father. At least three different people (Cersei, Bronze Yohn, and Sansa) all spoke against trusting the Dragon Queen this week. -No Wildlings this week. It appears they are on their way to Eastwatch by the Sea. -Many online noticed the seas around the Wall turning into ice last week during the opening credits. I watched this week and noticed the changing seas, but they only “froze” for a brief second before returning back to water. Is that foreshadowing or just an unintentional effect? -Melisandre made her first appearance this week encouraging Daenarys to meet with Jon Snow. I’m sure Davos will be thrilled to see the red priestess when he and Jon arrive on Dragonstone next week. -A convenient note dropped by Missandei this week. The “prince” in the “prince that was promised” prophesy is actually translated from a gender neutral word (so it could be “prince or princess.” How convenient!!!). -Speaking of Missandei, she and Greyworm finally hooked up the only way they can. Assuming Grey Worm survives the fighting, that will be a lot of fun for one of them for sure. -Jamie seemed to treat Sam’s brother, Dickon, as little more than an afterthought. -While she hangs out on Dragonstone, where is Dany keeping the Dothraki and her dragons? And what does she have planned for them? -The Inn at the Crossroads has appeared several times in the show. It was where the fight between Arya and Joffrey back in Season 1 took place. The Brotherhood, Arya, and the Hound stopped there in season 3. And Hot Pie mentioned Brienne and Pod’s visit from season 4. -Qyburn and Cersei looked at the skull of Balerion the Black Dread: the dragon Aegon the Conquerer rode to establish the first Targaryen king in Westeros. Don’t expect things to slow down from this point forward. See you next week. Game of Thrones Season 7 Episode 2 How do you cure Greyscale? How does Greyworm make love? Stormborn Recap Theon the coward What will Euron do? When do the Sand Snakes die?